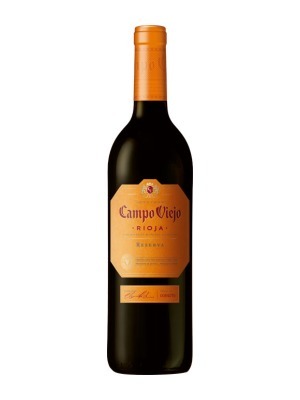 Campo Viejo Rioja Reserva is a popular Spanish Red Wine available from Tesco Groceries in 75cl to buy online. Visit Tesco Groceries for the best price for 75cl of Campo Viejo Rioja Reserva or compare prices on our other Spanish Red Wine products. Campo Viejo has a history dating back to the 1950's and this famous Reserva is created from carefully selected grapes grown in the Ebro Valley. With a light red colouring and a nose of vanilla and ripe berries this wine oozes flavours of toasty cinnamon, tobacco and tender fruits. An exceptionally soft wine with traits of spice given to it by maturing in oak barrels for eighteen months. A high calibre Rioja that is ideal for enjoying with friends or by yourself. Where to buy Campo Viejo Rioja Reserva ? Campo Viejo Rioja Reserva Supermarkets & Stockists. You can buy Campo Viejo Rioja Reserva online in most retailers and find it in the Spanish Red Wine aisle in supermarkets but we found the best deals online for Campo Viejo Rioja Reserva in Tesco Groceries, Amazon.co.uk, Tesco Wine, DrinkSupermarket.com, TheDrinkShop, and others. Compare the current price of Campo Viejo Rioja Reserva in 75cl size in the table of offers below. Simply click on the button to order Campo Viejo Rioja Reserva online now.